Beechholme (Kensington and Chelsea District School) prior to 1950. 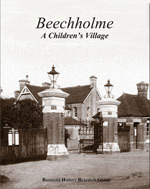 You can also order our book Beechholme – A Children's Village. Beechholme Period Details of contribution — Click links to view full stories. siblings 1916-1926 Barbara W. writes about her Great Aunt Mags and siblings, Charles and Reuben Moore . siblings 1933- Mrs G Calladine asks about Francis, Peter, Frederick and Emily Gough . siblings 1933- 1945 Linda and Steve ask about Harry, George, Mary and Lilian Ellis. Harry was Steve's father. Cooper 1915-1920 John, son of Henry, wrote in about his father who was at Beechholme around the time of WWI. 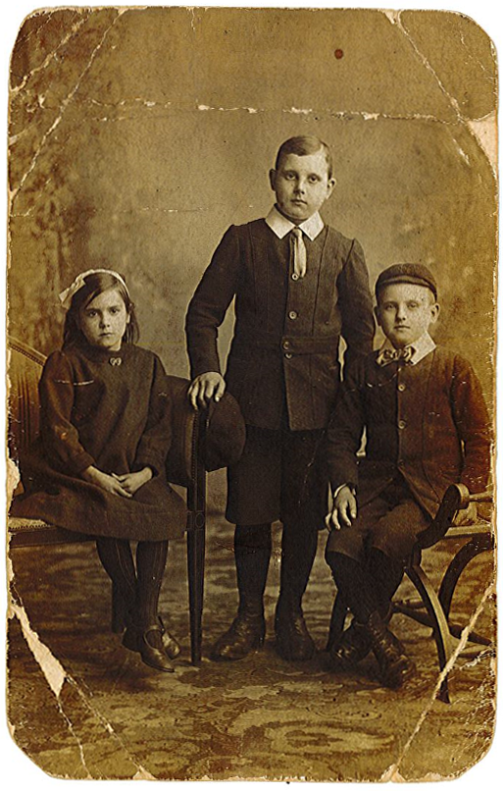 John has included a lovely photo of Henry and his siblings. Chapple 1940s-1950s Alan wrote in asking if anyone remembers him and his two brothers and their friend Roger O'Gara. Eric Law 1940s-1950s Sheila Law and her Brother Eric were at Beechholme in the mid 1940's. Eric has passed away but Sheila exchanged a few memories with Tony Lynham who remembers his friend well. Lucas 1940s-1950s Billy Lucas (Pine Cottage) would like to hear from anyone who knew him especially Stephen Akintibubo. Read about a quick piece of work by our professional genealogist Christine Kent. March 2013 - Story updated with photo after the two finally met after 60 years. Miller 1930s-1940s Mary Bulllough asks if anyone has any information on her Aunt, Kathleen Miller who worked at Beechholme in the 1930s or 1940s. Horwood 1916-1925 Margaret Dyson daughter of George Samuel Horwood sent us memories of his Education for life received at Beechholme in the early 1900s. Griffiths 1918-1925 Charles' daughter Margaret Scott sent us a short history of the Griffiths and the Smiths who were brought up at the Kensington and Chelsea District School in Banstead during WWI. 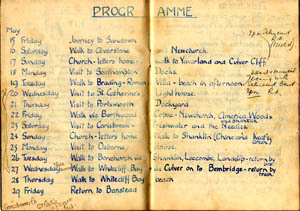 Lynne Rivenell supplied a notebook about the 1936 trip to the IOW. It includes the names of some forty individuals photographed during the trip including teachers Isabelle Mountjoy and Mr H. Colley. 1954 Frank Rowsell researching Elizabeth (Beth) Chalk. Do you know of her? If so let us know. 1940s Tony tells us all about his memories of the late 1940 where he remembers another young boy, John Bonnette who wrote to us two years ago. Dawson 1940s Joy Bridges nee Dawson tells us about her chickens at Beechholme.. Read her memories here (1940s). Hall 1940s Robin Chalmers reports on the death of Frank Hall, describing how they met in the USA. 1935 Helen Bowker wrote about her mum Vera Ida Washington who was at Beechholme for ten years between 1925 and 1935. 1921 Valerie Kassl (nee Baker) wrote in enquiring about her father Edward Henry Gent . Valerie also describes the process of obtaining his records. Condon 1936 (via Peter Eliot) sent a 1936 Group photo . Philip was at Beechholme for a few months that year. Bonnette 1939 John sent his recollections from 1939. He well remembers his visits to the German dentist. He would say "Open your mouth vide Tommy", we were all Tommy to him...."
Downs 1912 Terry Shoosmith has submitted a super photograph of the school staff taken in 1912. His grandmother, Esther Downs is in the photo. Barbara W. wrote to BHRG asking if anyone might recognise the address on a postcard. What she did not realize is that she had sent us an amazing piece of history which would be impossible to find in any other way. My great auntie Mags was born in 1909 and prior to her death in 2001, sent me photos of herself at Banstead. She believes she was there until she was seventeen. She was sent to Banstead with her older brothers: Charles, my grandfather, and Reuben, after their parents died in 1914 and 1916. I have so far been unable to find where this is. The photo shows the three of them. 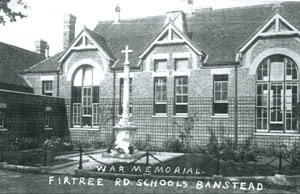 The address on the card was Cottage 10, Banstead School and given the rest of the story, the answer was very obvious; the kids were clearly sent to Beechholme or The Kensington and Chelsea District School as it was called at the time. The 1911 census shows the family living at Carlisle Street, Christchurch, St Marleybone. 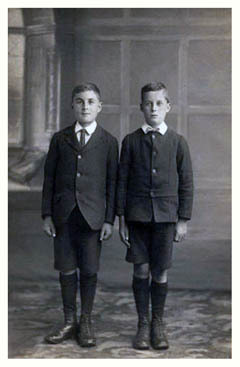 The siblings had an older brother Fred, born 1902, who did not go to Banstead. The siblings’ mother, Caroline died 3 May 1914 aged about 35. Their father Nicholas died 23 January 1916 aged 57. It is likely that they stayed with their mother’s sister Susie, who already had children of her own. She was unable to care for all of them and that explains why Mags, Charles and Reuben were sent to the school which at the time accepted children from Kensington and Chelsea and the surrounding areas. Barbara tells us that her grandfather Charles was in the army when he married her grandmother in 1930. They immigrated to Australia in February 1949 with their children. Margaret was born 5.8.1909 : died 11.1.2001 – married Charles Jackson 1931 – they did not have any children. 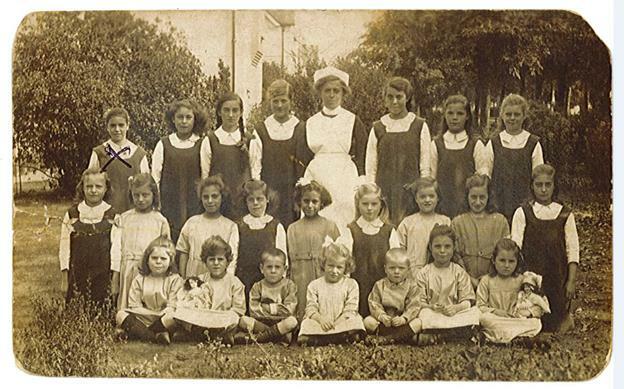 We rarely get photos of the school children from over one hundred years ago so in itself that is a rarity, but to have a group of children with all the names is like gold dust and Barbara agreed for the photos to be included on our website (see below). If you find your ancestor in one of the photos, or if you have similar photographs, do please let us know as they are an invaluable source for descendents researching their family history..
Group photo is dated 1926 by which time Maggie Moore had been there ten years. We have listed the names shown on the postcard below and will try and add more information over time to assist any descendants looking for them. My copy of your book, BEECHHOLME - A Childrens Village arrived here in Waterloo Ontario Canada. What a lovely history. To all of the people who collaborated to produce this book: Thank you very much for all of the work that was done to create this important and interesting document. It was a monumental task. My father did not talk much about his life at Banstead. In fact, we were very surprised to learn that it was this kind of facility because he made it sound like he lived with a family! Also, he did not say that his sisters were there also. One time, he was in a cross country running race. At the end of the run the kids had to crawl through a barrel. His pants caught on a nail and were torn badly. He ran off to hide and did not finish the race! Another time, he was walking through a farm field. There was a huge bull in the pasture. He ran “like the dickens” to escape that beast! 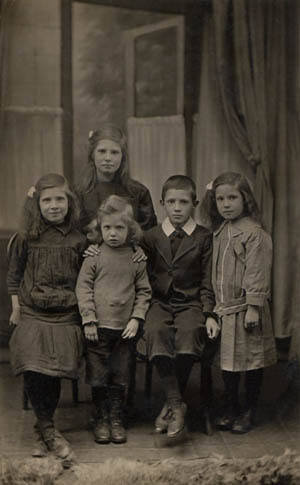 I have attached a photo of my father and his siblings before they left London for Banstead. This is the only photo I have of them at that time in 1915. Note Ernest is the blond haired child. He was called ‘Chick’ as an a adult. I was in Beechholme from 1957 to 1962 with my two brothers Raymond and Roy Chapple. The house parents were Mr and Mrs Bray and they had a daughter called Susan. NOTE FROM LNW - Christine Kent, a member of BHRG and professional genealogist quickly traced a Roger O'Gara to Lowerstoft in Suffolk and we hope to hear back from Alan who was due to write to him. Sheila Ellis (nee Law)of Cottage 13. Sheila wrote in in response to Tony Lynham's memories. Hi Tony, you won't remember me but I was very interested to read that you knew my brother Eric Law, and I laughed out loud at the antic about the drain pipe and the foray into the girls domain. Just a boy thing I believe, a pity they took things so seriously back then. I was six when I was taken to Banstead in 1945. I can't remember if Eric was there then or not. I suspect he may have been but I only saw him once in four years. Eric was five years older than me, very withdrawn and serious in later life. 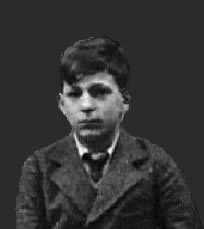 I think the separation from our parents at an early age effected him badly (they both died of TB when he was eleven) I was down the girls end of The Avenue in what was then cottage 13, the one before the infirmary on the left side of the road, so I never actually got to see him. Unfortunately he died in November 2000 aged only 65. I have good and bad memories of Banstead; my cottage mother was Miss Willox a stiff and starchy Scot. We always knew when she was coming as we could hear her shoes squeaking on the polished floor a mile away, needless to say she always gave us fair warning to stop whatever it was we shouldn't have been doing, not really unkind but very sharp and abrupt. Sometimes it was hard to understand why and what we had done to upset her. I remember walks to the downs and sports day on the field beyond the infirmary, picnics laying in the sun under the trees, and yes, sitting in the infirmary waiting for my turn in the dentist chair. I remember walking to school through drifts of fallen leaves and getting hit so hard with the cane because I was useless at math. I hated my math teacher, I'll never forget his name, maybe you knew him, Mr Robson. Most of the staff were ok but there is always one. Oh well, water under the bridge. Yes it's good to look back and remember it wasn't all bad. I hope you feel the same. Very best wishes Sheila (Law) Ellis. And Tony's edited reply . . .
Eric was a friend of mine who slept in the next bed, on my right. He was a quiet withdrawn sort of lad and looking back he rarely smiled or laughed. It must have been about the time your parents were lost and that explains why he was a sad lad most of the time. We went to the same School together and were in the same class. One day whilst walking to School he leaned on my shoulder to see the comic that I held. I gently shrugged him off, he fell and broke his leg. I called for an ambulance which took him away to hospital. When I arrived at School the Head accused me of fighting with him. Eric hobbled around for ages but he bore witness of what actually occurred. We were close friends and I never forgot him. I was in the Merchant Navy and returned from one sea trip to find an invitation to an old boy and girls reunion at Banstead. Eric was there and it was the last time I saw him. I'm so sorry that he is gone, and regret that he and I couldn't have had a chat about our boyhood in later years, but I can assure you his memory lingers on in my head. I'm pleased too that the memories stay with you. I'm thrilled to hear from you. Billy Lucas of Pine Cottage. My name is Billy Lucas born 1944 and I was in Beechholme in Pine Cottage in the late 1940’s and 50’s and would dearly like to hear from anyone who knew me. In particular, I would like to hear from anyone who has any information on my best friend whilst I was in the home. His name is Stephen Akintibubo and he is one of the kids in a group photo shown in the 1950's page on this website (here). The last time I saw Stephen was in the early 60’s when he was working in MacFisheries in Kensington High Street. Also in Pine Cottage was my brother Peter Lucas. Billy spent most of his childhood in Homes which later included Earslfield House, Murray House and Shirley Oaks, and he would like to hear from anyone who knew him from any of these homes. UPDATE: Christine Kent our professional genealogist traced Stephen within forty-eight hours. We sent Billy the address where we believed Stephen lives and Billy wrote straight away. He contacted it BHRG again and says "
I am pleased to be able to tell you that Stephen is still at the address you found for him and he rang after receiving my letter; Stephen was amazed to hear from me after all this time. It was great to speak with him after all that time, we both enjoyed a good 'chin wag'. "I am waiting to get my records and then, when I can be sure of my dates, I will write my memories for you. " 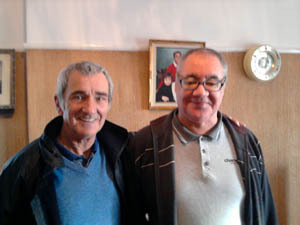 LATEST as at March 2013: Billy writes "I visited Steven on Sat 16th March it went very well; we had a lot to talk about as you would expect, as it has been 60 years since we were in Pine Cottage together. I have attached a photo of us, Steve is the one wearing glasses (the better looking one, as Steve would say). I had an aunt who worked at a children's home in Banstead called Kathleen Miller. She would have been there in the '30s and early '40s I would think. I wonder if anyone has any record of her or photos of staff at that time. I would be interested to know. I am in touch with her daughter, my cousin, for whom I wondered if I could find out anything. Miller was her maiden name,and my cousin, thinks she was a house parent. She would have been about 25 years old in 1935. She never talked about life in those days - I don't think my parents did much either. She apparently cycled over to Banstead from Earlsfield where she lived with her parents. She married in 1945, a soldier, Nicky Marshall, and went to Newcastle which was his home. It was only on reading about Beechholme that I wondered if there was any connection. My cousin has no record of where Kathleen had worked. George Samuel Horwood and Harry Horwood at Beechholme from c. 1916-1923/24. My father was George Samuel Horwood (George from his grandfather (George Tedder) and from his mother (Georgina); Samuel from his father and grandfather (both Samuel Horwood). Dad's brother was Harry Henley Horwood (Henley from their maternal grandmother's surname). Their gt.gt.grandfather (William Henley) was a Sergeant in the St. Helena Artillery on the Island of St. Helena when Napoleon was imprisoned there. Dad and Harry shown on the left and right respectively, in the photograph,were taken into Marlesford Lodge (Hammersmith) on 9th December, 1912 when George was just four years old. Sadly, on 29th January, 1913, their father died from tuberculosis, leaving the family almost destitute. Dad and Harry stayed at Marlesford Lodge until they were transferred to Beechholme in 1916 and 1917 respectively. Although he was away from home as a child for more than ten years, the practical things he learnt at Banstead set him up for life. Our garden was like an allotment - cabbages like footballs, juicy tomatoes. brussel sprouts, onions, lettuces, to name just a few veggies that he grew. The flower patch was like a mini-Chelsea Flower Show. Dad also rented an allotment. To enable us all (mum, dad, my brother and I) to have an annual holiday away at the sea-side, he used to repair neighbours' shoes at a percentage of the cost of the nearest cobbler's shop. He would carry large sides of leather a couple of miles from the shop to his shed in our garden for the repairing of shoes. (The shed he built himself). There is a photo on the web of the cobblers classroom at Banstead. Meals? His dinners were wholesome and tasty, consisting, of course, of his home-grown veggies. We had chickens in the garden, so ate the eggs they laid. Dad used to sew his own buttons on, do the washing ironing and housework, plus a bit of DIY, when mum was at work and all this whilst working shiftwork in a factory. His "education for life" (as I prefer to call it) at Banstead taught him all this. Neighbours used to think us "well-off" because we had an annual holiday, good food and clothes and a clean house - but it was sheer hard work; another thing he learnt at Banstead. I have a photo of dad which was taken just as he returned home from Banstead. Also, I have a framed copy of a typical day at the school, taken from one of the carers' handbooks. I went to Marlesford Lodge on 9th December 2012, exactly 100 years to the day after my dad entered the school. I received a really warm welcome from the groups there and was allowed to explore the building. Of course, the layout of the rooms had been altered from 100 years before. I also visited again on the occasion of the closing down party, when it had been bought by the Free School that now owns it. You can read more about the history of both Beechholme (previously Kensington and Chelsea District School)and Marlesford Lodge here. sent in by their daughter Margaret Scott. 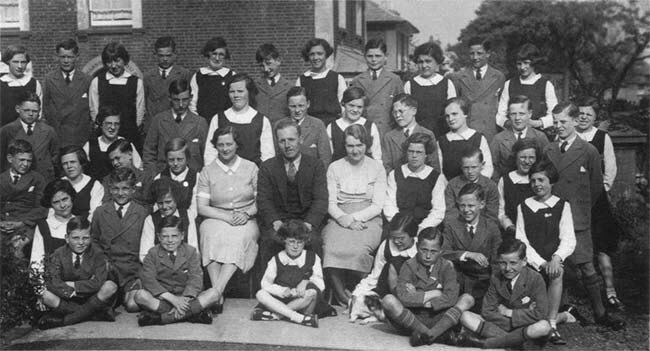 Both my parents and their siblings grew up at the Kensington and Chelsea District School (later Beechholme), in Banstead between 1918 and 1925. On leaving, my father, Charles Griffiths, was apprenticed to a Jewish tailor in the East End of London, having learned the rudiments of the craft in the on-site workshop. My mother, Lilian Smith, went into service with a doctors family in Sutton. When he was eighteen Charles went to an Open Day at Banstead and met Lilian's brother Frank, in Army cadet uniform. From him he obtained Lilian's address. Charles probably remembered Lily because the Headmaster made him dance with her at his first social evening at the home. She was very shy but must have made an impression on him as when he had earned enough pennies he went into Sutton and bought her a box of chocolates from Woolworths. They were both eleven years old at the time! Now eighteen, he wrote to her and they arranged to meet under the clock at London Bridge station on her Sunday half day off. This arrangement went on until Charles finished his apprenticeship and, being out of work, in 1929 went to Colchester to live with his married sister. 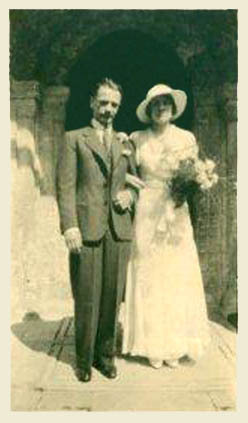 Lil, as she was called by the family, followed him when he found work, and they eventually married in 1934. They celebrated their Golden Wedding in 1984 with their two daughters and five grandchildren. Charles who had finished up with his own Gents Outfitters shop and tailoring business in Colchester died in 1998. Lilian had predeceased him in 1992 leaving a beautiful garden which her eldest granddaughter, Catherine, who took over her grandparents' bungalow, maintains as a memorial to them both. Frank Burton Smith served with the B.E.F. and was killed on the Escaut in May 1940. Two of his nieces finally left a wreath in his memory at the Dunkirk memorial on the 70th anniversary in June 2010. His brother Harry was sent, aged thirteen, to British Columbia, Canada where he eventually married and had two daughters. He was reunited with Lily and Charles in 1969 and visits continue between the next two generations regularly. Elsie Helena, Lilian's elder sister, worked in Harley Street most of her life as secretary to a prominent doctor. She retired to Colchester to be near her family and died in 2000. Charles' twin brother married and worked on the south coast as an engine driver. He died in the 1960's. Like most of their generation, neither the Smiths nor the Griffiths talked much about their childhood, but none of them appeared in any way damaged by their experiences. The education they received was obviously good, - my mother passed her '11 plus' but wasn't allowed to take up her place at grammar school. It's a sign of the times that the girls had so few opportunities I suppose. Dad's grounding in tailoring paved the way for his career and he always claimed that although strict, his house mother was always fair. He always recalled how the children marched to school each morning down that long avenue, each cottage group joining in as the line reached them. They were led by the school band, my mother's oldest brother, Harry, at the front playing the drum! We have no photo graphs of the home I'm afraid; we were grown up before we learned of our parents' time at Banstead. By the time I retired my mother had passed away and I determined to try and find out more about my father's early life. He resented being dumped as he saw it, but seemed to have had a much better life than his destitute parents could have given him. He was quick on his feet and played for the home football team. He also ran as part of the school athletics team at Stamford Bridge, winning his heat, for which he was awarded a collar box, and coming third in the final winning an Amida watch! He was less proud of scrumping apples from the orchard and pinching raisins from the food store! It is only since his death that I have traced his parents' death certificates. His father had a nervous breakdown and went into Hanwell mental home as a voluntary patient, which is why he was taken into care no doubt. His mother died of TB the following year, and his father of bronchial pneumonia before Charles left Banstead. My mother's parents story was very similar. I'm proud to think that my parents did so well under the circumstances, and shows that Banstead gave them a good education and enough stability to achieve a successful life. Do you remember Elizabeth (Beth) Chalk? Frank writes : Hello, I hope you can help me, I am doing some research on my mother Elizabeth Ann Chalke (Chalk) who was a resident at the Beechholme School, Banstead. I believe she was there between approx 1937 to 1954 and was also known as Beth. We have already established that Beth started at Beechholme on 15 Feb 1939. Her DOB was 20 Sept 1935. My early days were a constant upheaval. 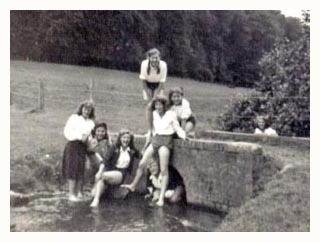 The war years separated me, an orphan, from my Grandmother in London to evacuation in Devon. World warII ended and I was returned to London, In a few months was dispatched to Banstead Residential School. 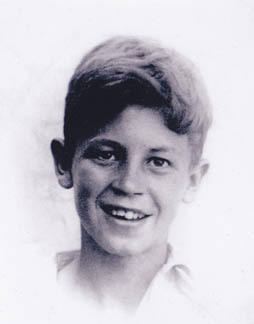 It was the early summer of 1946 and I was eleven years old. On arrival at the cottage of Miss Curtill I was shell shocked by her abruptness and severity. The slightest misdemeanour brought about unnecessary sternness and rebuke from the short stocky woman who possessed a severe expression and angry eyes that stared through thick spectacled lenses. There was very little humour in her cottage for two years of my three year term in the School. She took away two years of my youths happiness. Sad but true. Evening meal or tea was generally two slices of bread and jam with a little cheese, very occasionally there would be soup. We were always hungry. One learned very quickly that where you sat at the table, plus the speed of the hand when reaching for a piece of bread that might be a few thou thicker than another, Made all the difference in the equation for filling one's stomach. Miss Dougliesh the Scottish assistant when in charge fed us a little better and would occasionally make soup when we returned from the football field. Boys of my age were in bed by eight o'clock, lying on their sides whilst in the summer the sun streamed through the large dormitory windows. A toilet bucket was placed on the landing on the 1st floor. Talking was not permitted. In the morning there were jobs to do before breakfast Leaves to be swept up, outside toilets to clean, the yard to sweep, dormitories to tidy, beds to make, and woe betide a child who neglected their duty in any shape or form. We gratefully went to an outside school but on returning to the Residential school in the evening you would find yourself darning your socks before tea. They would be examined by the finger probing Miss C, and if you were in her bad books she would cause more holes to repair and any hopes of going to the sports field would be dashed. A child named Robinson, a small skinny lad kept running away but was returned by the Police. He actually went for a knife one evening and threatened Miss C with it. He finally placed it down after some persuasion but it served to confirm that not all of the children were happy by any means. I actually sleep walked into the pantry one night. I awoke to her shouting and threatening me with all manner of abuse. I was obviously confused and for a punishment was made to stand in the downstairs passageway for several hours for a couple of nights afterwards, staring at a picture on the wall of a Welsh valley. I recall one day after a snow fall she took us for a walk. A snowball was thrown and that was followed by an assault which would have put the Allies at Normandy to shame. She fell over in the snow and received a snow pummelling I doubt she ever forgot. Older boys were given more respect and slightly better treatment but I suppose that's acceptable to a degree. Miss C would stand in the bathroom and stare at us washing and bathing. Her eyes were everywhere but then so were naked little boys who were very aware that it did not seem appropriate when you're approaching 14 years of age for an adult woman to be in your midst. Then came a wonderful change for some of us. Those that had reached 14 years of age were transferred to another cottage across the Avenue. It was a joyous occasion for we were now in the hands of dear Miss Coates. She proved to be completely the opposite to Miss Curtill. (I'm uncertain about the spelling of her name) and gave us a wonderful feeling of freedom. She would sit in the kitchen in Rendal and rock with laughter as we all strived to amuse her. She was lovely and her assistant Mrs Husan was equally so. We pushed Miss Coates up Boxhill on one outing and would do anything for her. Three of us (including a boy named Eric Law) climbed down a drainpipe one night. We ventured to the girls end of the school and conducted a kiss chase game in the sports meadow. The girls also escaped from their dormitory. However on our return up the lane at the rear of the Admin block we were apprehended by Mr Raynor. At 8am the next morning his cane delivered six of the best onto our unprotected bottoms. Miss Coates hardly said a word bless her. 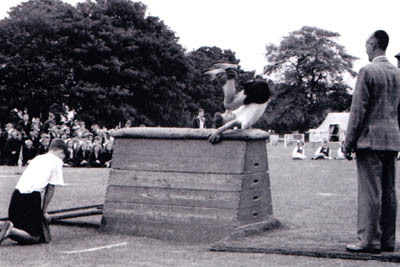 Mr Kelly watches Tony Lynham vaulting over the horse in 1948. I remember John Bonnette very well. I recall his humour and his cheeky grin. He pulled faces and made us laugh. I certainly recall his being in the band. I remember going to School with Eric Law. I recall too Stanley Clark and Alex Cummings. They were older than I and had more freedom. The school football team lost to a neighbouring team and Stanley Clark commented to Miss Coates when she enquired how we got on. "We won" he said. "That's wonderful" she replied, "what was the score?" "We one, they six." came the clever subdued answer. One evening the Banstead scout troop came to entertain us. I recall taking an opportunity to sing at the piano for the school. The song was Have I told you lately that I love you. a Bing Crosby song. I wonder if anyone remembers that evening in early 1949. When our hearts were light. There were a few people who were involved in strange activities of an intimate nature and no doubt they know who they are, but generally speaking with the exception of one or two people in authority who cast dark shadows, the Residential school known to many as Beechholme later, in the forties was better than many private schools. We had a band, a swimming pool, two sports fields, a cricket pitch, a church, and healthy Banstead downs air. We had summer fete days and sports days. We even had ballroom dancing lessons where boys were taught how to invite a girl for a dance. That final year we also went to camp at Walton on Naze. (If you're reading this Valerie, do you recall creeping into my tent in the middle of the night, just for the hell of it. It was 2am and I thought you were really daring). Mr Raynor asked me before leaving the school "What are you hoping to do Lynham?" "I want to go to sea sir." I replied. "Jolly good, he said beaming, "a life in the Royal Navy, excellent idea." "No sir," I replied, "the Merchant navy." I recall he studied me for moment with disappointment spreading over his face. "Not very good at all." he muttered. "Close the door when you leave." I've been in three walks of life where discipline is paramount, including the Merchant Navy, the Parachute Regt and the London Fire Brigade. The grounding I had at Banstead Residential School, certainly in the final year, was very sound and stood me in good stead for all three. I learned a poem: Vitae Lampada by Sir Henry Newbolt (The lamp of life) I hope there is someone out there who can recall the meaningful words. I certainly can. If you wish to contact me please do via this webmaster link. After 50 years or so, I am very pleased to report that Tony and John are now back in touch with each other . The following is just the start of their exchange of emails. Great to receive your reply. I thought as two years had passed since you sent that text to the Beechholme magazine perhaps you were not around anymore. Well on reading your piece I recognised immediately that you had some memories of Banstead Residential School. I am an old scholar from Beechholme, born in 1935. I remember Mrs Lloyd the Matron and also Mrs. Hoare. When I first arrived at Beechholme I lived in cottage 9 where my cottage mother was Mrs. Weir. On getting older I moved to cottage 6, where my cottage mother was Miss Sunderland who was a lovely lady. I moved onto to Roedean, sleeping in cubicles. We had pillow fights and midnight feasts. One girl couldn`t join in as her toe cracked. Her name was Violet Bunyon. I remember one day when I collected my pocket money and went to Sutton market with a friend. I bought two little yellow chicks for a shilling; we didn`t tell the cottage mother. I put them by the side of the black lead boiler to keep them warm; I remember it well as I cleaned it many times. Beechholme boys in the 1940's. It was not long before the cottage mother heard chirping and she made me take the chicks to the matron who very kindly let me keep them in her back garden. I used to feed them when I came home from school. Eventually they died, but we did not have them for dinner!! We never had any eggs either!! I also remember that we used to go to Epsom Downs Derby Day to the fair. I am really looking forward to reading the book on Beechholme and have enclosed two photographs. I now live in Southend in Essex. Do you recognise anyone in the photos? Do you remember Joy or the chickens? What happened to Violet Bunyon? Write inand tell us. 25 Nov 2008 - FRANK HALL passed away last night in the city of Tacoma which is about 30 miles south of Seattle USA. Robin Chalmers writes- About five years ago I was asked to be a member of Washington State Hall of Fame Committee for football. I met a fellow by the name of Frank Hall. He and I both being the only Brits among a whole group of Americans immediately hit it off. What was truly amazing is that Frank lived in Beechholme and attended the boys school in Picquets Way during the war from 1940 up until about 1950. October 2008 - Memories from Helen Bowker about her mum, Vera Ida Washington. My name is Helen Bowker and my mum was at the school from 1925 until 1935 but she never knew who her mum and dad were. I only have her dad's name and I have been trying to find out anything I can about her although she has died now. I feel it is part of me also. My mum's name was Vera Ida Washington and the superintendent at that time was a C L G Raynor. I do have all her papers from the school but it is any contacts who may still be alive who knew her that I am trying to trace or any photo's that there may be with her on. I have looked through all the papers I have from the school and they are quiet vague. She appears to have gone to the school's hospital a few times and it then says returned to cottage. The address it gives is Fir Tree Road and most paperwork is signed by C L G Raynor as either headmaster and then superintendent. My mum did not say much about the school when she was alive as she was only five when she went in. She talked about a cottage and they all had chores to do. I am sorry I cannot tell you more but my mum only spoke about an aunt who was Alice Barrett who could have been her real mum, fetching her in and out of the home or one of Alice's other two sisters was her real mum. Thank you. Anything that might crop up with your help would be great. (please read the file on La Marsh George), have you any idea what that would be or is it a place? DOB 17/12/19. Left the school to go "to trade" on the 28 March 1934 and presumably returned, to leave again on the 10 Oct 1935 to go into service. If you have any more information that could help Helen find out more about her mum please mail the webmaster. October 2008 - Enquiry from Valerie Kassl about her father Edward Henry Gent/Baker. I am trying to find where my father was placed after he and his younger brother were removed from their family home in Chelsea somewhere around 1907 or thereafter. I understand that some indigent children from the Chelsea area were placed at Beechholme and was wondering if you could possibly check the old admissions register. My father died in 1955 when I was seventeen and he rarely spoke of his childhood, but did say that he was in a home in the South of England and his younger brother was placed somewhere in the North. My father: Edward Henry Gent born 24 Feb 1905 (GRO 1905 Mar Chelsea/1a/407). Although he was registered as Edward Henry Gent, he was always known as Edward Henry Baker (his mother's maiden name). My father's brother: Levi Arthur Gent born 10 Jun 1906 (GRO 1907 Mar Chelsea/1a/412). I looked into various sites on the web regarding Beechholme School - all very interesting but nothing (as far as I can see) pertaining to the period 1909 to 1921 (the time that my Dad and uncle were there) and I would like to know about the school and its residents. I was wondering if you know of any other folk whose parents were at Beechholme between 1909 and 1921, there should be quite a lot still around (I am 71 and still healthy and well). I would really like to hear from others whose parents were there at that time - maybe they knew my Dad and uncle - you never know. Any information you can supply will be very much appreciated. Thank you. NOTE FROM THE WEBMASTER - The register we have covers a few years from 1933 onwards so we were unable to help Valerie directly however if you know anything about Beechholme between about 1910 and 1920 please mail the webmaster. First I contacted the London Metropolitan Archives online with a short e-mail giving my name and address and relationship to whom I was looking for with Subject Line: Beechholme school, Banstead. I gave details of who I was researching - name, date and place of birth, last know location, etc. I also received a reply from The City of London enquiries service. It was a very straight forward process and the cost was about £30 - well worth it. I received a report giving some general information on Beechholme as well as my father's details - it took about 5-6 weeks to get the report. I suggest that anyone interested should first contact the London Metropolitan Archives. Lewis Wood, the BHRG webmaster has helpfully set up direct links below. These will open up a new blank e mail correctly addressed to the right place with a subject heading of "Beechholme Residential School records enquiry - ". Click here to start mail. The LMA hold surviving records for the period between 1930 and 1965. All enquiries must be made in written form either by letter or by email. You will not require any proofs of identity to submit an initial enquiry but these must be provided before the LMA can disclose full information. IMPORTANT : The LMA no longer do initial look-ups on the telephone. Please be aware that the contents of any surviving files vary considerably but sometimes one small piece of information turns out to be more significant than a pile of documents. The LMA do not provide a family tracing service but Christine Kent, a member of BHRG, and a professional genealogist, may be able to help. Please visit Christine's website here. Nov. 2007 - Contact from Philip Condon (via Peter Eliot). This photo was taken on a trip to Sandown Isle of Wight in the summer of 1936. Philip Condon is the boy in the bottom left corner (squinting). He was in the home for about 6 months in 1936 as a temporary orphan. I sent him a letter out of the blue and in reply he sent me the only photo in his collection. The following list shows most of the individuals that went on this trip and comes from a small notebook belonging to the teacher, Miss Isabelle Mountjoy (see update below). The note book shows just the initials but we have been able to match the surnames with students in an admissions log which covers the 1930s. The log shows their date of birth and these children were all born between 1921 and 1925. 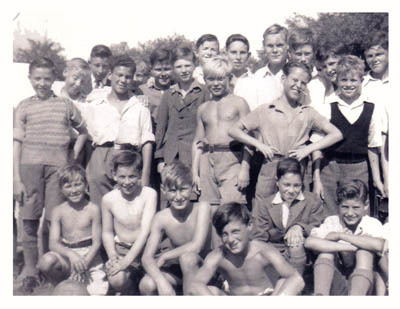 Boys: George Ellis, Sidney Robert Seeley, Francis Keys, Richard Ponsford, Sidney Clark, Albert Healey, Cyril Gordon Skingle, Valentine Lee, Robert Carpenter, James Barker, Frederick Tinsley, Arthur Beane, George William Harrington, Reginald Constant, Phillip Condon, Richard Attridge, George Tinsley. Teachers: Mr H. Colley and Miss Isabelle Mountjoy. The reason for my contact is that I inherited a book from a neighbour of mine a Miss Isabelle Mountjoy who was a teacher at the school. She gave me a notebook of a trip to the Isle of Wight in 1936 showing the names of all children who went and everything they were expected to take, collect and do whilst on holiday. 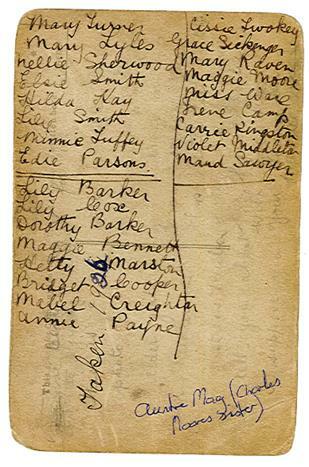 It is a fascinating document and after seeing the photo of the trip in 1936 I feel sure that the list of names of the children on the trip must be ones in the photo. I have kept this as I felt that my grand children may be interested but on finding your site think that it would be of more interest to all the ex-pupils who have contributed to your memories. 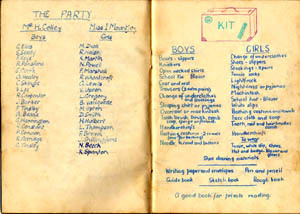 It is a notebook which I think must have been given to all the pupils as there are sections for them to fill in. Isabelle Mountjoy was a lovely lady and when I asked her about the School she was not very forthcoming and just said that the pupils came from troubled homes - having read some of the stories I can see why. I know Isabelle would be pleased to think this little book would help with the history of Beechholme. She did have an ex-pupil called "Benny" who visited her regularly. I do not know if this was first or surname but Isabelle said she was very proud of her because despite her difficult home-life early on, she went on to become the Queen Mother's gardener and I wonder if this story rings any bells with anybody. UPDATE APRIL 2014 - We received an email from Linda who is looking for any information about her father-in-law Harry Ellis. Linda says "I would just like to ask if anyone knew of any of the Ellis's and if anyone can identify George Ellis in the photo. Harry sadly passed away in 1983 and as a family we would like to try and piece together our family history and hopefully meet up with some relatives. Harry never spoke about his childhood and was a very contented family man so there was no need to discuss anything from the past. We believe he was at Beechholme for quite a few years along with his twin siblings, George (pictured above)and Mary. Another sister, Lilian, was also at Beechholme for a short time. By a strange coincidence, within two days of Linda's email, we received a second email about four members of one family two of whom were twins. I would like to enter names of my relations to your lists. 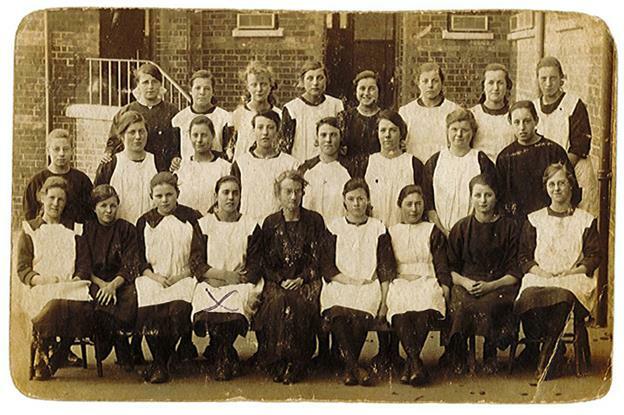 All were transferred to Banstead during 1933 when Norwood school closed. The names are as follows. Peter Gough dob 07/02/26 TWINS. Any information on any of them would be much appreciated. I and my two sisters came to Beechholme in 1939 on the death of our mother. Then it was known as The Banstead Residential School. On arrival we were separated, I to the infants' section, my sisters to the girls' section. I was evacuated twice, once to Reigate Surrey and once to Helston in Cornwall. My sisters and I were billeted at different addresses in Reigate. My sisters stayed in Reigate and I returned to Beechholme and stayed until I was fourteen years old. I still remember the layout of the school. You came through the main gate and immediately on the left was the head master's house, with a big yew tree in the garden. The headmaster was Mr Rayner and I had the cane off him a few times. To the right was a staff house. You then came to a T junction. In front was the administration building, to the right and left was The Avenue which was lined on both sides with cottages. Why they were called cottages I don't know, as they each housed two large dormitories, a bathroom that held I think four baths and as many wash basins. Also on the ground floor, was the house mothers' room, and a large kitchen. At the back of each cottage was the WC and an outhouse, there was no inside WC. At night, a bucket was housed between the two dormitories, for the use of the boys. The boys were all housed in cottages to the right of the administration building, each cottage called A, B and C and so on up to K which was the senior boys with A being the youngest. As you grew older so you moved up The Avenue. Prior to leaving I was in Rendal which was on the other side of the road to K cottage. There were two house mothers to each cottage, I can remember the ones in K were Miss Kirtell who ruled with a rod of iron and a Miss Doulgleash, who was a bit nicer. In Rendal I think it was a Miss Coates, but I'm not sure. Down the girls' end which was left at administration building, the cottages were the same as the boys'on the right. Following on from the administration building was the school where Miss Tibbs used to slap my legs with a ruler as I wasn't much of a scholar. Then Cottages on both sides till you got to the bottom. Rodean, the senior girls building, was the last. Opposite that was the infirmary. I remember the dentist would visit the infirmary;I think he was German. He would say "Open your mouth vide Tommy", we were all Tommy to him. The worst part was sitting waiting for your turn and hearing the the boy in front yelling, and knowing you were next. Beyond the infirmary was a large field used for sports day and other events. I was in the brass band. The band room was at the far end of the boys section alongside of the gymnasium. I remember band practice was three nights a week, and you had to go. I wonder if there are any old boys left out there who will remember me. I'm seventy three years old now so I suppose its a bit much to ask. Still ya never know. 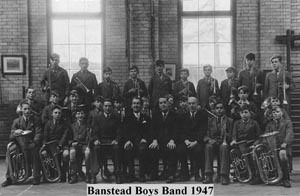 NOTE FROM THE WEBMASTER - Well John, your wish is our command, and within 24hrs, our friend in Aussie land, Peter Eliot, supplied us with this picture of the brass band taken in 1947,originally sent in by Vincent Phillips. Thank you Peter. John is the second boy from the right in the front row. The man two to the left of John is none other that Mr Rayner himself. Don't forget to visit Peter's web site which has many more Beechholme Photos. APRIL 2005 - Terry Shoosmith says, " I'm afraid I don't know the date of the postcard, but the photograph (below) is dated 1912 and my maternal grandmother is second from the left in the second row up. At that time she was Mrs Esther Downs, born 1877, a widow with a daughter of 5 or 6 years of age (my mother, born in July 1906). 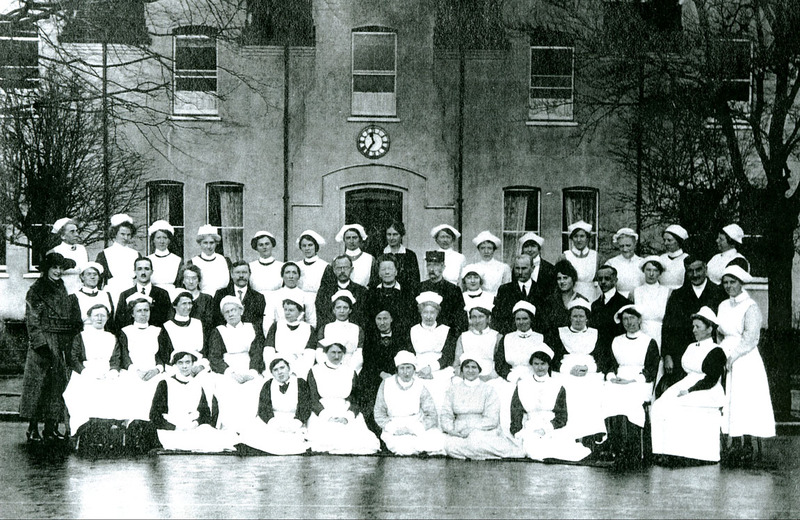 Beechholme staff photograph dated 1912. "The family were originally from the Woolwich/Plumstead area of South East London, where my grandmother had served as a ward maid on one or more of the hospital ships moored in the Thames near Deptford during the smallpox epidemic of the late 1890s and early 1900s. During that time, she met my grandfather, Henry Downs, ex-Royal Navy, who was a piermaster with the same organisation, i.e., the Metropolitan Asylums Board. They were married in 1902 but he died in January 1906, six months before my mother was born. As far as I know, my mother would have received much of her education at "The Schools". Later she worked at Dixon & Co, an estate agents in Sutton - right opposite the station - and at some point met my father, whose family home was "Whitgift", Grange Road, Sutton (now a block of flats, I believe."